Film and TV luminary Carl Reiner doesn't mince his words when talking President Trump on 'Larry King Now'. Larry King: You use a cellphone? Larry King: But you tweet. Carl Reiner: I tweet, yes, I use my computer for that, I tweet every day. My major thrust is saying something about Trump that may get him impeached. Larry King: You’re trying to get him impeached. Carl Reiner: He’s doing it himself, he’s impeaching himself every day. Larry King: How did that start? Did it start with Trump when he was running? Larry King: I know your son is furious. 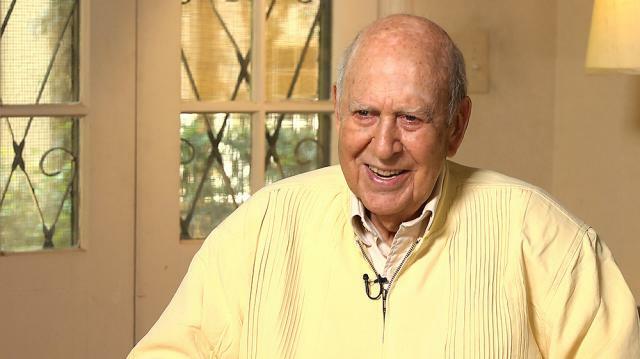 Carl Reiner: There is a—oh, did you—my son interviewed, didn’t see it—oldest grandson made a little Tweet, not a Tweet, a little thing, I sent it to everybody. It’s somebody waking up in the morning, a guy waking up in the morning, realizing, which is everybody, Trump is our president. So he wakes up, “ahhh,” he starts to scream. You see him going to the toilet, brushing his teeth, going about his business, but screaming. Goes into the street, people are screaming. Driving his car, business as usual, he’s being very pleasant, but screaming. Cross the street, he goes to the market, a woman comes out of the market, face “ahhh.” The world is going about its business, but in the back of the head, “ahhh, Trump is our president.” It is hysterical. The last thing is the best, where women, beautiful women in leotards doing their exercises, “ahhh,” screaming, with the teacher helping them, she’s screaming. I wake up every morning, that’s the first thing I think of. I turn it on to see what he’s done that can get him impeached. Larry King: I know him very well, I wouldn’t vote, but I know him. Do you know him? Carl Reiner: No, I’ve never met him. And he’s not going to like to meet me. Larry King: What would you say to him? Larry King: Oh the budget. Larry King: That won’t go through. Carl Reiner: He has no heart. His only thrust is—and by the way, Bernie Sanders keeps talking about it—he’s going to lower the tax rate, mainly for himself. He’s going to get billions of dollars, his net worth is incredible. Larry King: But they may not pass, that budget won’t go through.